Apart from CSOM API, REST API introduces another approach to access SharePoint list data from platforms on which the CSOM may be unavailable. The SharePoint REST interface is based on the REST-based Open Data protocol (OData) which is a platform-independent open standard. Create an HTTP request using the POST verb. Use the service URL of the list to which you want to add an entity as the target for the POST. Serialize the JSON objects that represent your new list items as a string, and add this value to the request body. 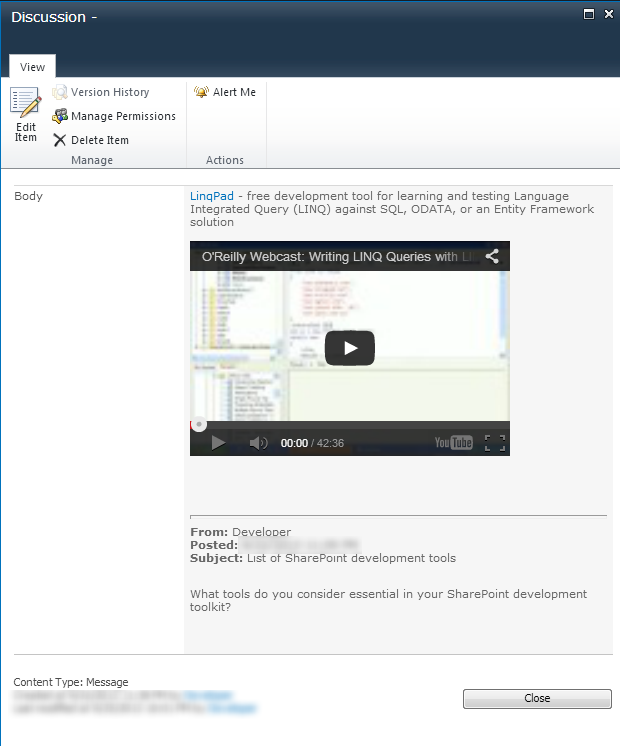 The following code snippet demonstrates how to perform a Create operation against a SharePoint list. Create an HTTP request using the GET verb. Use the service URL of the list item to which you want to add an entity as the target for the GET. Add an X-HTTP-Method header with a value of MERGE. Add an If-Match header with a value of the entity’s original ETag. In contrast to reading list item to update an item you will need to pass the eTag value, which could be obtained during item read. “If-Match”: item.__metadata.etag can be used to specify the actual eTag value (‘item’ is the object returned from SharePoint containing the list item in JSON format). “If-Match”: “*” can be used to match any eTag value resulting in the operation being performed regardless of the actual value. They form part of the Ajax call for updating an item. eTags are part of the HTTP Protocol V1.1, more information on the topic can be found here. Add an X-HTTP-Method header with a value of DELETE. For invoking a generic methods we utilize MethodInfo.MakeGenericMethod method. 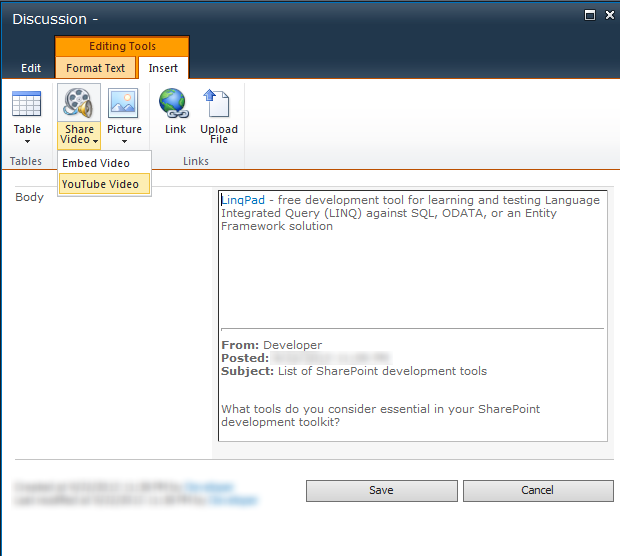 Below are demonstrated some examples of usage SharePoint 2010 Client Object Model (CSOM) in PowerShell. The example below demonstrates how to create wiki page via CSOM. In contrary to article Using PowerShell to Get Data from a SharePoint 2010 List that explains how to execute generic methods via inline C# in PowerShell, this post demonstrates how to utilize Generics Methods in PowerShell natively. SharePoint Server OM provides PortalNavigation class that represents navigation for portal pages and other portal navigation objects. In turn the PublishingWeb class is used to access the navigation settings (PortalNavigation type). What about Client Object Model? Unfortunately it is not supported to access and manipulate Navigation settings via CSOM since there is no PublishingWeb Client Object in SharePoint 2010. But still it possible to accomplish via Client Object Model. 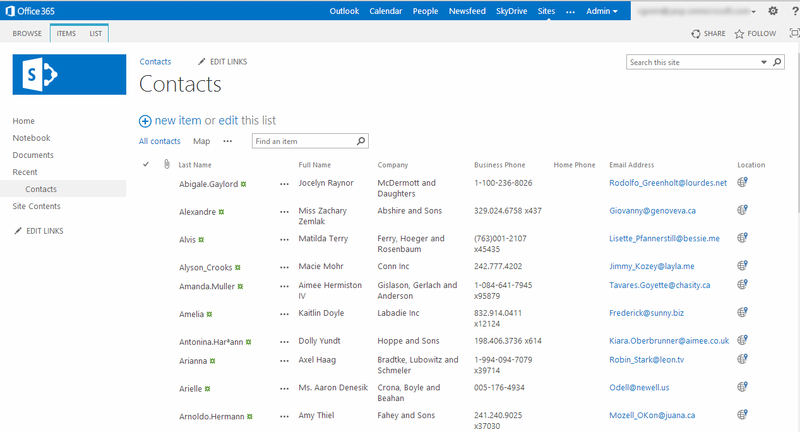 ClientObject provides a base class for objects on a remote client, the full list of client objects available in SharePoint 2010 could be found on MSDN page. Since Publishing API is not supported in Client Object Model of SharePoint 2010, there is no way to manage the navigation settings for a publishing site the same way as in Server Object Model. But as was demonstrated in this article it could be accomplished via Web Client Object and Web.AllProperties property. In turn, in SharePoint 2013 Microsoft.SharePoint.Client.Publishing.Navigation namespace was introduced, in particular WebNavigationSettings class for managing the navigation settings for a publishing site. Note: Dialogs may not be available on all forms. Interesting, isn’t it, but what exactly does it mean? 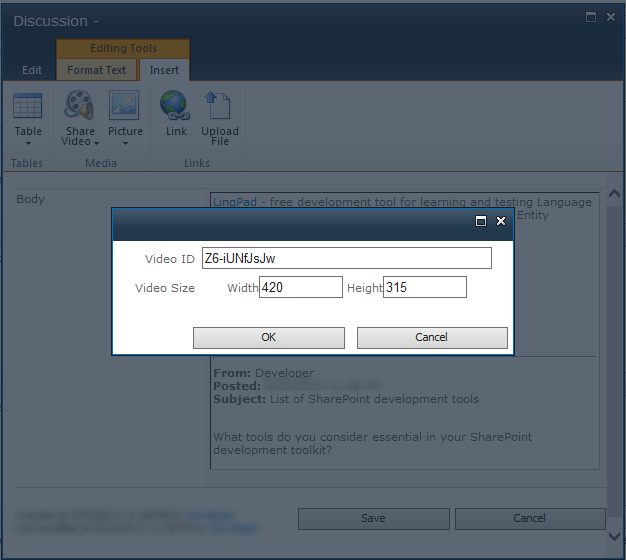 In order to find out we need to investigate how List Dialogs settings is handled in SharePoint 2010. So, Let’s get started. 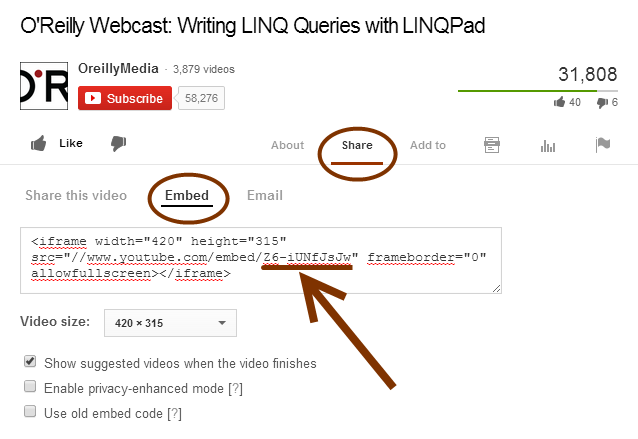 Depending on which option is selected link events for List/Library forms (New|Edit|View) are handled differently. When the “Launch forms in a dialog” is selected form pages are opened in modal dialog boxes. This template is intended for rendering extra information about List settings on the client side (ContextInfo structure). It is invoked every time when the List View is rendered on page. Pay attentions that List Dialogs setting that corresponds to NavigateForFormsPages property of ContextInfo structure. Now it is time to return to the question about why this settings is not available on all the forms. For answering on that question let me step back and explain a little bit about rendering a List View. Up until now we were talking only about rendering a List View via XsltListViewWebPart that handles view rendering for default lists, such as document libraries and announcements. But what about ListViewWebPart that is used for rendering specific List Views like Calendar, Gantt or Chart Views. The point is that this parameter (List Dialogs) does not take into account when a List View is rendered via ListViewWebPart. And the message “Dialogs that may not be available on all forms” concerns exactly this situation. 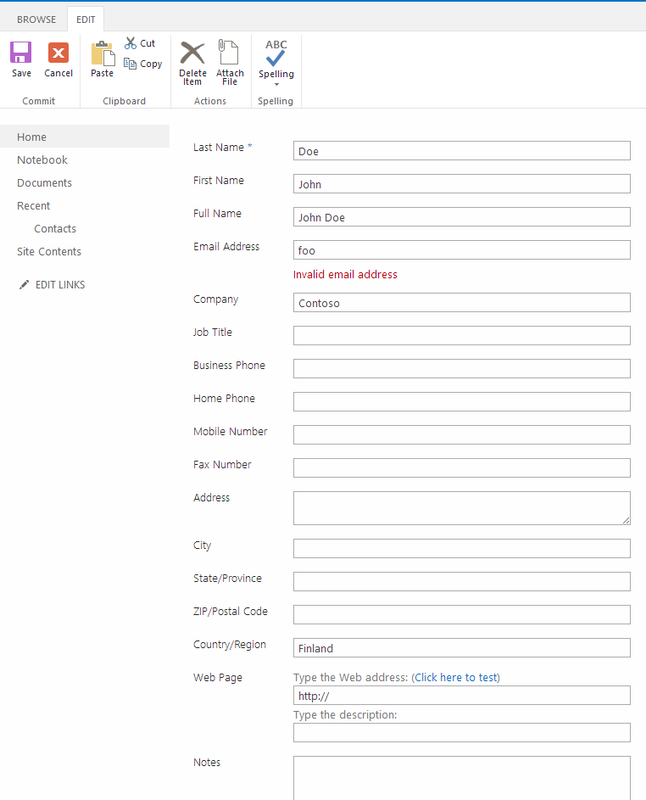 Then the question arise, how do we deal with the case where we need to open List Forms as a full pages for ListViewWebPart? Let’s consider a real-world example when we need a Calendar forms to be opened as a full pages. There are several ways how to achieve it, but we will consider only one, one of the simplest. The idea is to specify explicitly NavigateForFormsPages parameter for ContextInfo structure. That’s all, after that the Calendar forms will be opened as a full pages.